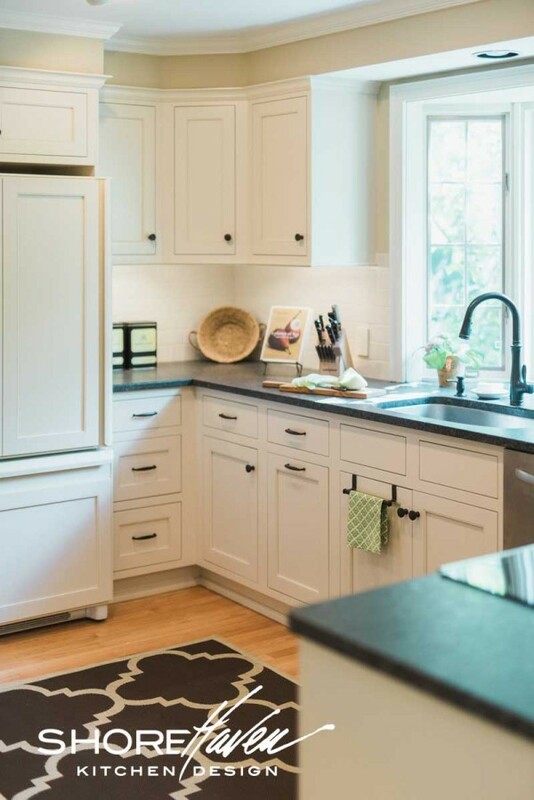 Drawn to white’s simplicity, classicism, and a craving for everything to be open, clean, airy, and light, this Queensbury, New York kitchen remodel is anything but vanilla. 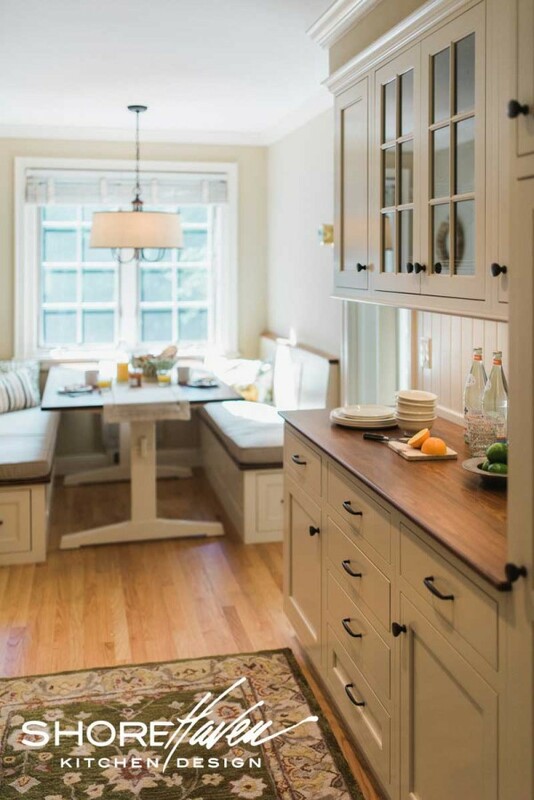 Featuring a banquette nook, butler’s pantry and built-in baker’s wall, there’s endless storage and counter space, perfect for cooking, baking and gathering. Baker’s wall offers plenty of storage for cookbooks, cookware, ingredients, and microwave. Baker’s wall opens to the adjoining butler’s pantry. 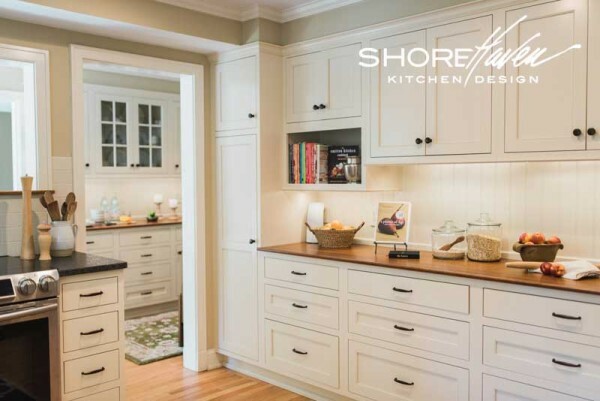 Antique white inset cabinetry offers a soft, subtle alternative to the crispness of white, white paint. 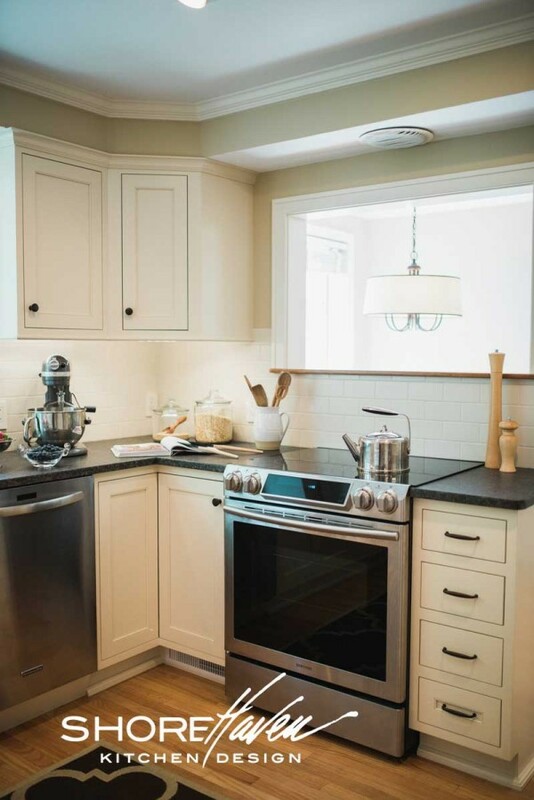 The matte finish creates a warm glow, accented by LED undercabinet lighting, wide plank beadboard and matching subway tile backsplashes. Butler’s pantry and banquette nook offer the perfect transitional space from kitchen to living area. 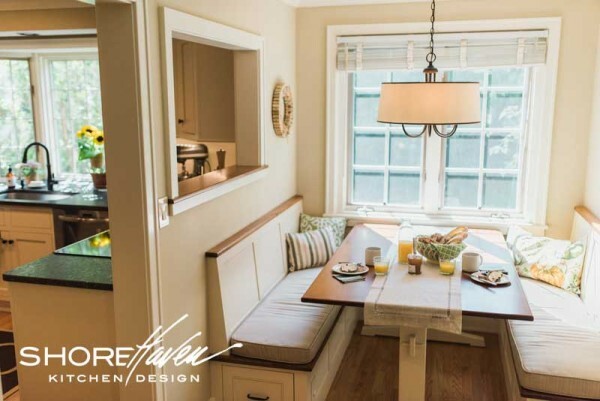 Perfect for a cozy morning breakfast, or relaxing afternoon tea, the banquette nook might just be our favorite part of this kitchen. The bench seats and trestle table add charm and functionality to a once underused space. Now all we need is a good book to curl up with! 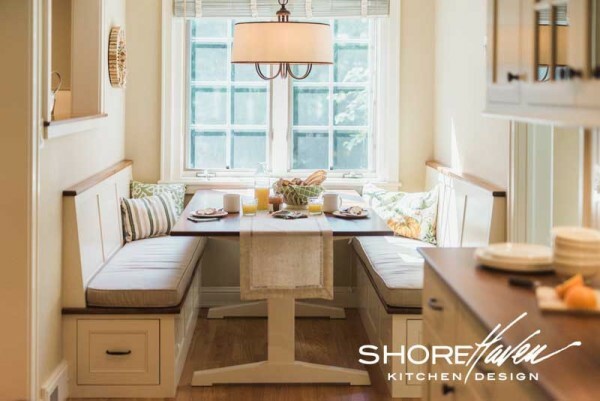 Built-in banquette nook with bench seats and trestle table handmade by ShoreHaven Kitchen Design. When we began the design process with the homeowner we knew they wanted to stay true to the architecture of their 1940’s home. We kept the existing soffit and integrating it into the final design. The finished kitchen photos are proof that a soffit can work in a modern kitchen without looking dated. Cherry counters add warmth to the built-in baker’s wall. A pass-thru window between kitchen and banquette nook let light flow from room to room. Honed coffee brown granite around the range and sink offers a softer option than the traditional polished granite. 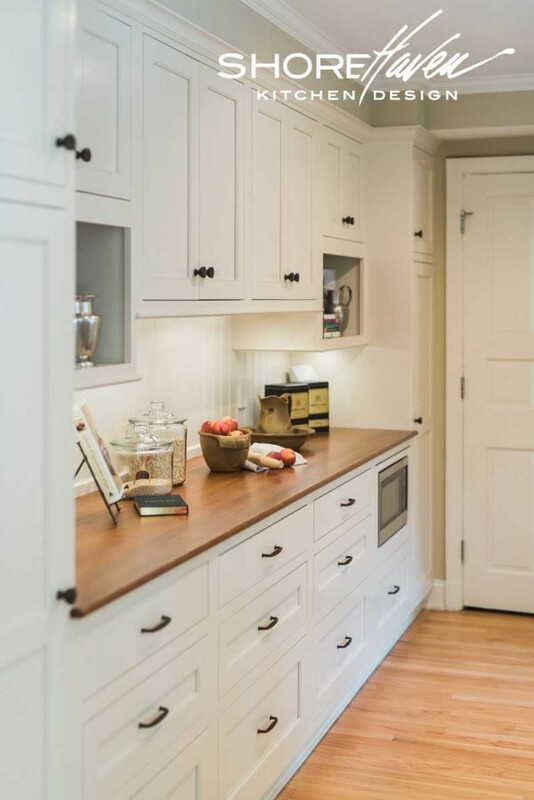 For the butler’s pantry and baking wall, cherry furniture-style counters add a vintage feel to the built-in cabinetry. 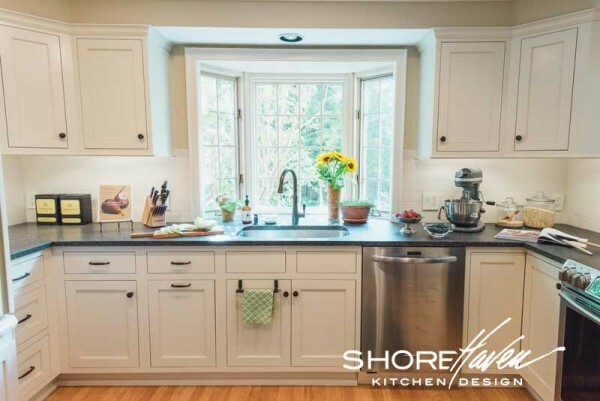 Bright, cheery and timeless, this white kitchen will always be at the top of our favorites list. Coffee brown granite with a worn antique finish for the counters. Matching matte antique white subway tile backsplash, seamlessly transitions from wall cabinets to base. Existing soffit incorporated into the kitchen design with added crown and trim. 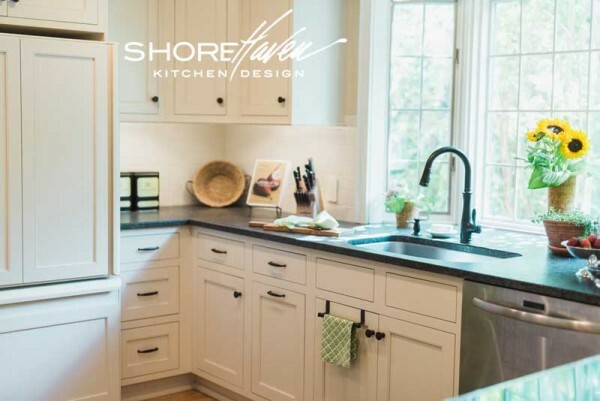 Custom panels allow the existing refrigerator to blend into the surrounding cabinetry. 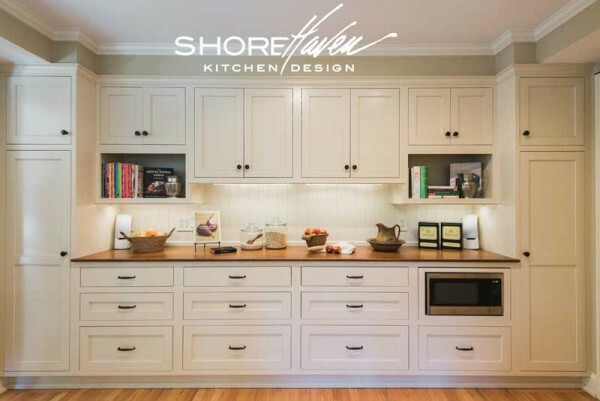 Cabinetry design and installation by ShoreHaven Kitchen Design. Banquette, trestle table and cherry countertops handmade by J.R. Henderson.